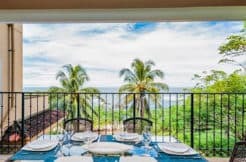 Located just one block off the beach in the heart of Tamarindo this 3000sf, two story penthouse features floor to ceiling windows and HUGE ocean views. 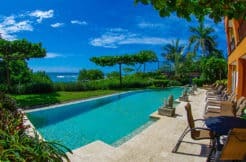 Situated in the center of town yet only steps to the beach makes this the perfect choice for your Tamarindo vacation. Each bedroom features it’s own en-suite bathroom, flat screen TV and plentiful covered outdoor terraces. A gourmet kitchen PLUS a tournament pool table round out the offering. The building itself features underground parking, two large elevators, swimming pool with outdoor kitchen, change rooms, bath, etc. This place has it all and you can walk to EVERYTHING.